Olympic 2008, First Gold Medal for India.. 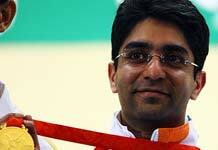 Yes, "Abinav Bindhra" the Indian Won the Gold Medal in shooting.. This was happened after 28 years of the History, the First Indian Won the Gold Medal in Olympics.. As a Indian we are very happy about this news.. In all the television and the Radio channels are talking about the same things.. All the very best to "Abinav Bindhra", and thanks for the same. Be Proud to be an indian..
alright! Congratulations to Miss Bindhra! im always so happy for the athletes that win medal that havent in a long time, or ever have before! and for the gold medalist to be a woman is even more fantastic! im sure the ppl of your country are extremely proud of her and will welcome her home with much celebration! BEIJING (Reuters) - Abhinav Bindra won India's first individual Olympic gold medal on Monday with a thrilling come-from-behind victory in the men's 10m air rifle. Bindra had been fourth after qualifying but had a brilliant final round and the Indian, the epitome of tranquillity, hit a near perfect 10.8 on his last shot to pull in front of Henri Hakkinen of Finland, who fell to bronze with a poor final shot. That late stumble by the Finn allowed China's Zhu Qinan, the defending Olympic champion and heavy favourite, to salvage a bitter day with silver. Zhu sobbed uncontrollably on the podium and again at a news conference. news courtesy:thomson reuters.. My hearty congrats to MR.Abhinav:) well being an Indian im very proud of this guy! Thank you friend, thanks for your response..
hello chennai_b02 yes, it is a very good news to indian.I think it is the highest reputation to win the first gold medal for india for Abinav Bindhra. It is only a little distance for our chinese athlete to get the gold medal,so he won the silver medal in this competition of shooting. In any way, congratulation to you.I hope all athletes can make their biggest effort to win the games. good luck . cheers !! hi friend, iam a Indian, now i feel happy, because i born in India. take care. Now Abhinav has won first individual Gold Medal for India. it was really a dream come true. we are lucky also that it happened in our time.its really awesome. Bravo Abhinav!